Should Morneau save or spend? Finance Minister Bill Morneau has a lot of room to play with deficit numbers today amid a much brighter economic picture. The question among economists is how much he'll put toward that, and how much he'll spend, when he unveils his fall economic statement after markets close. Minister of Finance Bill Morneau announces the government’s economic update during Question Period on Parliament Hill, in Ottawa on Thursday, Oct. 19, 2017. "Beyond any policy measures, the bigger theme will be a much smaller-than-expected trajectory for the budget deficit," Bank of Montreal senior economist Robert Kavcic said in a lookahead to the fiscal update. The Liberals put the fiscal 2016-17 deficit at $17.8-billion, or $5-billion better than projected. That stronger showing was because of a perkier economy and the fact that "they just couldn't get infrastructure money out the door as quickly as they wanted." According to Ottawa, its picture improves by $4.5-billion for each percentage point in better-than-expected economic growth. Of course, interest rates are rising alongside of that, which hadn't been factored in, noted Royal Bank of Canada economist Josh Nye. "That increase would add about $0.5-billion to the deficit this year and more than $1.5-billion five years out," he said. "Over all, stronger growth and higher interest rates should trim the projected deficit by about $4-billion in the current fiscal year and $3-billion annually over the next four fiscal years." "Based on our current forecasts for real GDP, prices and interest rates, as well as Ottawa's sensitivities, there should be more than $6-billion of upside for the budget balance. And, even if we assume that roughly $3-billion of spending that didn't get out the door last year does so this year, it could get absorbed by the contingency, still leaving room for a much smaller deficit." Remember, too, that Mr. Morneau spent all of last week rolling out a new tax policy for small businesses amid an outcry over the government's plans. Among the changes was a cut in small-business taxes to 9.5 per cent by early 2019 from 10.5 per cent now. That, noted RBC's Mr. Nye, will cost $2.9-billion over five years. "Some offset could come from other changes to small business taxes," Mr. Nye said. "As well, an unrelated $4-billion special dividend from [Canada Mortgage and Housing Corp.] should offset the tax cut's impact on the deficit profile," he added. "Given its relatively small size, the small-business tax cut isn't likely to provide a noticeable boost to the economy – particularly if proposed U.S. tax cuts erode Canada's relative advantage." As The Globe and Mail's Bill Curry reports, Mr. Morneau will spend at least some, unveiling new measures to help the world's flavour-of-the-month middle class. Included in that is expected to be a proposal to further enhance the Canada Child Benefit, which economics have said has helped juice the economy. Mr. Kavcic wonders if we may see more on taxes "fleshed out" today, questioning if the cut in the small business rate was "an example of one measure that might have been set to drop in this update." Some observers want Mr. Morneau to prepare for the inevitable rainy day. "The government has so far not announced any new spending measures that would eat into the fiscal dividend," said Mr. Nye. 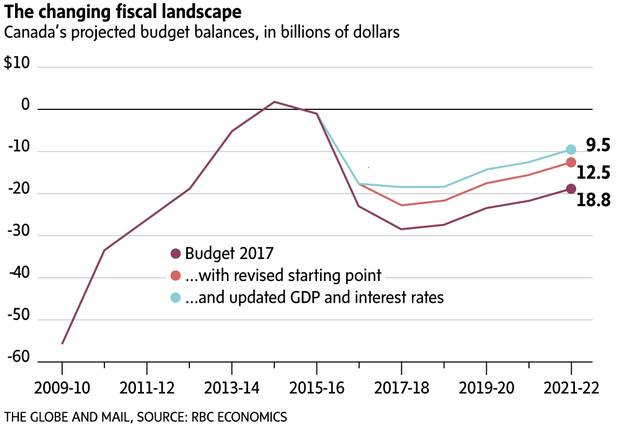 "We think that is prudent, as even with an improved deficit profile the government won't return to balanced budgets over the next five years in the absence of greater fiscal restraint." "While it is the case that the debt-to-GDP ratio remains manageable and is set to decline over the projection horizon, deficits as far as the eye can see are a concern when fiscal headwinds from an aging population are intensifying," Mr. Nye added. "Persistent deficits suggest future tax hikes will be needed to close the gap. That would certainly be unwelcome when the Canadian economy is already facing competitiveness issues related to carbon taxes, electricity prices and minimum wage hikes." "The big question is: Spend it, or save it? If the latter, it would go a long way toward restoring some credibility on the credit front." Hudson's Bay Co. has a $1-billion deal to sell its Lord & Taylor flagship store in New York to WeWork Cos and team up with the office-sharing business to run its operations in parts of HBC's stores, The Globe and Mail's Marina Strauss reports. Toronto-based HBC, which is under pressure from an activist shareholder to monetize its real estate, said Rhone Capital, an investor in WeWork, is making a $632-million equity investment in HBC, which also owns its namesake stores and Saks Fifth Avenue. The retailer expects to continue to run the Lord & Taylor store on Fifth Avenue in a shrunken space in that building after WeWork converts it into its New York headquarters as well as shared office space to lease to other businesses or individuals.